The Hollywood animation "Incredibles 2" topped the box office over the weekend drawing 1.12 million moviegoers, while the Korean supernatural thriller "The Witch: Part 1. The Subversion" surpassed 3 million in total attendance, data showed Monday. 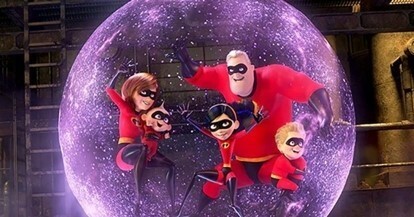 The Disney/Pixar sequel earned 9.65 billion won ($8.5 million) or 47 percent of the total ticket sales from Friday to Sunday, according to the computerized box-office tally from the Korean Film Council. In total, the movie has garnered 1.36 million views in the first five days of its run. "The Witch" passed 3 million in total attendance, staying for nearly a month in the top five since it opened on June 27. The movie was at No. 3 with 320,833 admissions over the weekend. Starring new actress Kim Da-mi and directed by Park Hoon-jung, the movie tells the story of a girl who is raised by an old couple after losing her memory but regains her power and memory in the process of being chased by a mysterious group of people with supernatural powers. Hollywood star Dwayne Johnson's giant building action movie, "Skyscraper," slipped two notches to fourth with 164,731 views in its second weekend.